Join us to celebrate Ontario climbing at the 5th annual Beaver Valley Climbing Festival (BVCF) on July 14-16! This year, we will increase the supply of clinics by unbundling them from the overall festival fee. We hope that, this way, there will be enough clinics for everyone who wants one. Please sign up and pay for clinics directly with the provider. Thank you for your understanding. ONE AXE PURSUITS has been in operation for 16 years and offers the largest variety of climbing courses in Ontario. New to outdoor climbing? Moving on to Trad climbing or multi-pitch? Venturing to the ice or snow capped mountains? ONE AXE has the courses you need to do it safely. 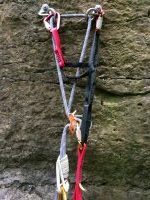 Many sport climbing locations require sport climbers to rappel off the finish anchors. This transition can be scary and dangerous without the proper knowledge or equipment. Join us for this hands-on clinic that will have you practicing several safe ways to rappel off your sport climbs and backing up your rappel. Many climbing accidents have happened on rappel. With the right knowledge, many of these accidents can be turned into a minor inconvenience. In this hands-on course, you will practice escaping from hair pulled into rappel device, ascending techniques, transferring from rappelling to ascending, load transfers and rappel safety tips. The first program will run on Saturday and Sunday from 9am-12pm, and the second program will run on Saturday and Sunday from 12:30pm-3:30pm. Maximum 6 people per class. Afraid of falling while climbing? So were we! Until we spent years getting over our fear of falling. Now we will work with you to help you get over yours. Join us for this 3-hour condensed version of our 1-day course where we work with you towards giving you the skills to make decisions about the safety of a potential fall, how to best catch and receive falls, and making you in control of your climbing instead of being subjected to your fears. Spots available. Sign up early. Prerequisites: Students must be lead certified in a gym and must be comfortable leading 5.9 in a gym. Outdoor experience not necessary, but a bonus. ALL PARTICIPANTS MUST BE A PART OF THE BEAVER VALLEY CLIMBING FESTIVAL. To signup: Register through Overhang Adventure’s site (click here). Contact Amir at 647-525-2647 for any related inquiries. This exciting one hour workshop will teach you important ways to adapt your current indoor climbing skills as well as add a few more to your toolkit in order to improve your climbing. In this workshop you will focus on the key elements of climbing outdoors and develop a better understanding of the different challenges outdoor climbing poses as well as approaches to overcome them. Together we’ll also learn effective body positions that make outdoor climbing easier. Specially created for this BVCF event, Mark is offering this workshop to an intimate group of eight excited learners in order to ensure everyone can take advantage of peer to peer learning as well as quality one on one time to ask questions. This clinic has something to offer to all climbing abilities and levels of experience. Sign-up now! Registration is on a first come first serve basis and is likely to fill up quickly. Location: To be decided by weather conditions; directions will be provided upon complete registration. Get ready to explore the underworld. We go in with helmets and headlamps – and climb and crawl our way through a variety of crevices and caves. Don’t worry if you have never caved before, we teach you everything you need to know!! This activity does require some physical ability but as mentioned before – total beginners are fine doing this! What to wear: Layered clothing with a long sleeve top or hoodie. Clothes you don’t mind getting wet & dirty! Long pants are recommended. What to bring: Water to drink (in a day pack so it’s easy to carry) and a camera! An introduction to the basics of ascending a rope and a variety of haul systems. This course is a great intro to self-rescue techniques for climbers interested in expanding their current technical skills. Ascending and hauling are useful skills for those who enjoy multi-pitch climbing and/or traditional climbing. Open to 6 participants. Sunday 9am-12pm. Learn the art of placing tri-cams and hexes for traditional protection. This course will cover the basics of placing these types of trad gear so you can build and improve upon your current gear placements and be more confident climbing traditional routes. Open to 6 participants. Saturday 12pm-2pm. Learn how to rappel in a variety of settings, and the pros and cons of several different rappelling methods and back ups. Rappel or anchor building experience recommended. Open to 6 participants. Saturday 9am-12pm. Come and try real rock climbing and even rappelling on the beautiful Niagara Escarpment! Sunday 8-4. 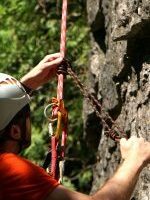 Improve your lead belay skills and face the fear of taking lead falls outside. Learn how to fall properly outdoors and how to catch lead falls in a variety of settings. Must have outdoor lead climbing experience and ability to climb 5.7 outdoors. Open to 4 participants. Sunday 10am-1pm. Improve your lead belay skills and face the fear of taking lead falls outside. Learn how to fall properly outdoors and how to catch lead falls in a variety of settings. Must have outdoor lead climbing experience and ability to climb 5.7 outdoors. Open to 4 participants. Saturday 9am-12pm. This course will teach you a variety of techniques to get yourself out of a jam while sport climbing. Learn the safest methods on how to bail off a route, how to get past that crux you just can’t do, how to deal with ropes getting stuck and more. Must have sport climbing experience. Open to 6 participants. Saturday 1pm-4pm.